One of my favorite dishes breakfast, lunch, dinner! In a medium saucepan, bring 4 cups water to a boil over high heat. Reduce heat to low and whisk in grits. Cook until grits are tender and creamy, about 30–35 minutes. Stir in the cheddar, parmesan, and 1 tbsp. butter and season with salt; cover and set aside. Season shrimp with salt, cayenne, and black pepper. Over medium-high heat, add shrimp to skillet with the bacon drippings and cook, turning once, until bright pink, about 2 minutes. Transfer shrimp to a plate with a slotted spoon. Lower heat to medium; add mushrooms and scallions to the skillet and cook, stirring occasionally, until tender, 5 minutes. Add garlic and saute until golden, about 1 minute. Raise heat to high, add chicken broth, and scrape bottom of skillet with a wooden spoon. Boil until broth reduces by half, 3-5 minutes. Return shrimp to skillet along with the lemon juice, remaining butter, and hot sauce and cook, stirring frequently, until sauce thickens, about 1 minute. Divide grits between 4 bowls; add the shrimp and its sauce and garnish each bowl with bacon and parsley. Bon Appetit! 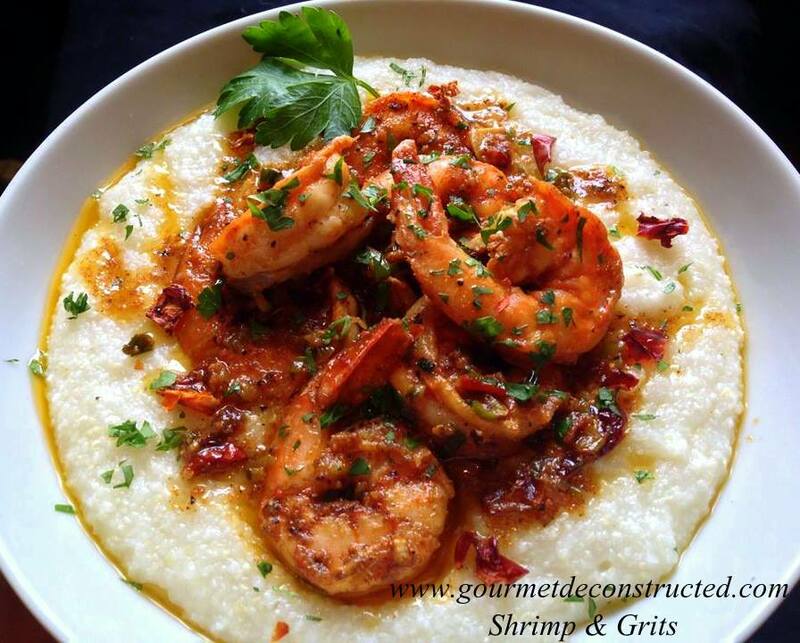 Posted on May 30, 2014, in Seafood and tagged cayenne pepper, grits, seafood, shrimp, southern cooking, spicy shrimp, white cheddar. Bookmark the permalink. 5 Comments. Beautiful! The sauce looks rich and decadent! Lovely, appetizing recipe bar the fact that we in Australia do not have ‘grits’ 🙂 ! But have met them before and can substitute for a very moreish dish! !